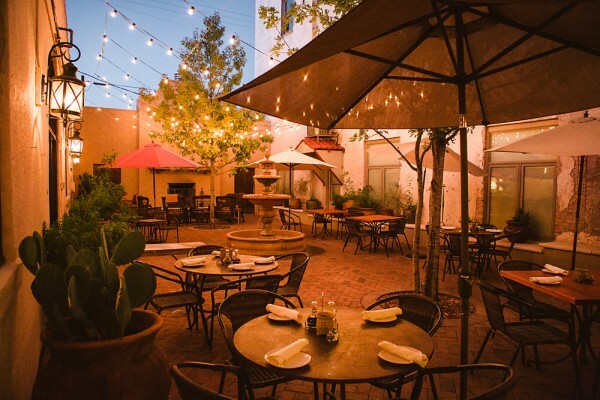 Nestled back behind the Holland Hotel is the Century Bar & Grill’s Courtyard. This outdoor setting is a unique venue in Alpine and is the perfect spot to unwind following a day’s work or a sightseeing trek through the Big Bend region. Here you can enjoy a cool drink, a warm beverage, a bottle of wine, or a specialty cocktail while you satisfy your appetite with the full dinner service offered in the Courtyard from our hearty yet elegant menu. The Courtyard evokes the mood of a classic hacienda in its ageless design of Saltillo tile, its opulent fountain and its massive fireplace. The open-air site is bursting with dozens of native plants, trees and flowers and is festooned with subtle lighting cascading from overhead. The Courtyard also frequently boasts live music from locally renowned performers as well as by visiting artists. Whether you choose to kick back and star gaze or kick up your heels, natural Southwestern loveliness, comfort and hospitality await you in The Courtyard.